Sometimes you hear the call of the open road. And sometimes you feel the call of nature. What to do? 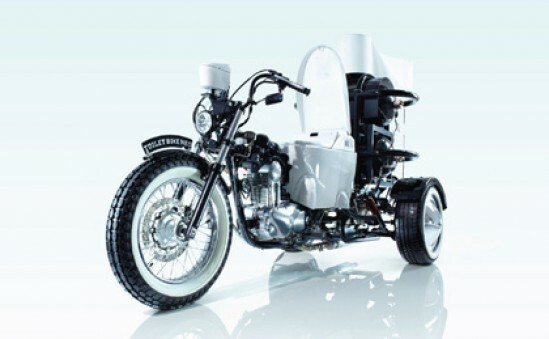 Buy a motorcycle with a built-in toilet, of course! The toiletcycle hybrid is designed to run entirely on human waste, so if riders choose to wear underwear with the flap in the back and drink a ton of coffee while riding, theyâ€™ll enable Easy Rider status forever. As if that isn’t cool enough, the bike is named Toilet Bike Neo. The slick Neo suffix will make you forget the Toilet prefix. But the poo-power and the flashy name are just the beginning! So you can relieve yourself AND write light messages in the air while riding a motorcycle, and then play music to draw more attention to yourself. This is what we call a game-changer, folks. In fact, when the networks inevitably do their remake of “Chips” I want Ponch and John patrolling California’s highway system on a couple of Neos!